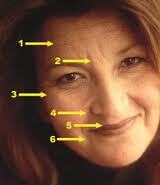 An aging face is characterized by both wrinkling and sagging. Many of the patients go to the doctor believing that their forehead lines are caused by excessive worrying or frowning. 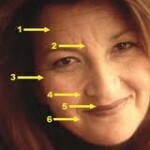 It is quickly explained to them that facial expressions do not cause wrinkles — on their forehead or anywhere else. Those vertical “frown” lines between your eyebrows (known as glabellar lines) and the vertical ones across your forehead would not be there at all if your skin hadn’t become damaged by the sun. They are the result of facial muscles interacting with sun-damaged skin. Children move their facial muscles all day long. They don’t get lines or wrinkles. Forehead folds and (other facial wrinkles) occur because of the damage the sun inflicts on our skin’s collagen and elastin matrix. The sun breaks down that matrix, leaving skin thinner, saggier, and less able to regain its former, tighter contour. Because forehead wrinkles — both the verticle and the horizontal ones — are formed (but not caused!) 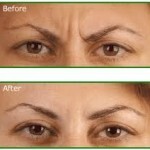 by muscle movement, using a muscle relaxer, like Botox or Dysport, is an effective way of minimizing their appearance. 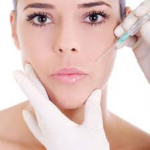 For very deep lines, dermal filler, such as Restylane or Juvederm, may also be needed. These treatments are temporary. For lasting results, you will need to repeat them every few months or so. In order to have a more youthful appearance many times we turn to the cosmetic surgeon to correct the sagging aspects of the face. We also look to other invasive procedures for the wrinkling aspect such as laser resurfacing, deep acid peels and Botox injections. As we are all aware, these aggressive procedures carry risks. Also, they can often leave us with an unnatural appearance. How else can I get rid of frown lines, wrinkles and crow’s feet? Recent research using topical anti-inflammatories such as alpha lipoic acid, dimethylethanolamine (DMAE) and Vitamin C Ester indicate that significant correction of both the wrinkling and the sagging component of the aging face can be corrected. Topical DMAE causes immediate increase in the appearance of skin tone and with continued use significantly lifts and contours the sagging face. It is especially important to apply liberally and often to the chin area, jaw line and neck as this area is particularly susceptible to sagging. When combined with either alpha lipoic acid or Vitamin C Ester surface defects such as fine lines, large pores, discoloration, lack of radiance, as well as dark circles and puffiness under the eyes are significantly improved. Though some of these products do seem to deliver a certain measure of very temporary results, they can in no way be compared to the results achieved with Botox injections or with surgery. If they could, wouldn’t we all be using them? The real kicker is that most of these products cost almost as much as the real thing. If it sounds too good to be true, it probably is. Most doctors worth their salt will tell you to save your money and skip the lotions and potions. It seems that some doctors who are aware of the problem are offering Botox-resistant patients another option in the form of botulinum toxin type B (which is sold under the brand name Myobloc). This form of the botulism toxin has proven effective in patients suffering from cervical dystonia (a painful neuromuscular condition affecting the head and neck), pediatric urinary incontinence, migraine headaches, and other medical problems –- even in patients who have developed resistance to botulinum type A (Botox). Although it is not approved for cosmetic use, some doctors do offer this off-label use as an alternative for Botox-resistant patients. Is there any treatment for those deep lines that run from the nose to the chin? Those deep lines are called the nasolabial folds, and they are just that — they are more than lines, they are folds. This means that those are caused by sagging and elongated facial muscles. Twice daily application of a DMAE lotion can significantly improve the appearance of these defects. In a recent study, a DMAE lotion combined with electrical stimulation of facial muscles over a 12-week period showed even more improvement.